The new edition of Pandemic takes us back before zombies to where it all began. 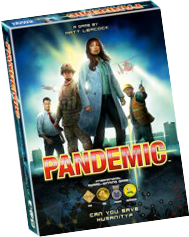 Disclaimer: Z-Man Games kindly provided me with a review copy of the new edition of Pandemic. Zombies. I am so sick of zombies. Just when you think the game industry couldn’t support another zombie-themed game, another five are released. Which is why it was so refreshing to sit down and play Pandemic again the other day. It’s been several years since I played this classic—and I think we can use the word ‘classic’ now—thanks to a copy of the new edition arriving in the post from the kind folks at Z-Man Games. Because when you come down to it, the popularity of zombies isn’t just about the fear of the shambling undead. It’s about the fear of infection that we all carry within us. That fear that we can catch something that will take us over—eat us alive as it were. It’s the fear of being food for another organism. So let’s go back before the zombies, back to the source of the infection, and back to when cooperative games were a pretty new idea—back to 2008’s Pandemic. 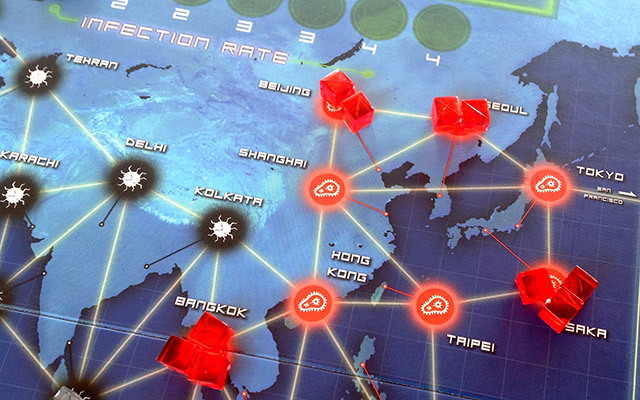 Matt Leacock’s simple yet ingenious game of global infection and control is simply one of those games that every boardgamer should have in their library, and now this reasonably-priced new edition is out, there really is no excuse not to. In Pandemic, players work together to halt the spread of four diseases across the globe, and collectively win if they cure them all. Eradicating them is possible too … which will certainly make life easier for everyone involved. The very clear 8 page rulebook (and I’ve condensed those rules into a one page summary sheet) sets out the simple rules. Each player takes on a role with a different special ability. On your turn you get to take four actions. There are four different ways of moving around the board to get to the disease hotspots, and you can also build a research station, attempt to clear a city of disease cubes, share cards with players in the same city, or cure a disease entirely. Most of the time you do these incredibly useful things by discarding City cards; usually one matching the city you’re in. If you’re at a research station and are able to discard five City cards of the same colour, you can cure a disease. It doesn’t wipe the pestilence from the map, but now if you treat the disease in a city you can remove all disease cubes of that colour instead of just one. Remove all the cubes of a cured disease from the world map and it’s eradicated and no longer a threat. As you’ve probably already gathered, there are a lot of options for things to do on your turn. Perhaps you’re even thinking you’ll be wiping out disease in no time. But the game doesn’t just sit there and take it, oh no. It fights back. In a relentless, mindless, just-like-a-global-epidemic way. And this is where Pandemic is not only a brilliant game, but a perfect implementation of its theme. After your actions, you draw two player cards. If you happen to draw an Epidemic card, after the collective groan from around the table has faded, you move the infection rate marker one space along its track, and then draw the bottom card from the Infection deck. Three brand new disease cubes go onto the revealed city. What’s worse, if the city already has three cubes of that colour, the disease starts to spread … move the outbreaks marker another space along its track and place a cube on every city connected to the original city. This can cause a chain reaction outbreak in these new cities, adding another cube … arrrghhhhh!!!! But it doesn’t stop there, I’m sorry to say. Whether there was an epidemic or not, you must flip over Infection cards equal to the current number on the Infection track, and those cities get a disease cube of the matching colour (possibly causing another outbreak …) And now for the final indignity. Reshuffle the Infection deck discard pile and place these cards face down on top of the Infection deck. Evil, isn’t it? When Matt Leacock, the designer, came up with this little twist he must have cackled gleefully to himself. The threat starts slowly enough, and virgin players may even think casually to themselves, “this game is easy”. But the infections increase, the epidemics start, and things snowball very quickly indeed as several hotspots around the globe explode outwards like an opening flower in a time-lapse film. It isn’t long before it’s a frantic push and pull between containing the existing outbreaks and trying to cure the diseases. And time is short; there are three ways to lose, and only one way—cure all four diseases—to win. However, against the calculating compassionless villainy of the game system you do have some weapons up your collective sleeves. A few useful Event cards are shuffled into the player deck. Most effectively, each player has a role with a special ability: for example, the Medic can remove all cubes of a colour, not just one, when treating a disease. Damn handy that. The Scientist only needs four City cards to cure a disease. Whew! Some roles are inevitably better than others, but they’re very useful indeed and you’ll have to work together to get the best out of them, especially as the difficulty of the game ramps up. Pandemic can very simply be adjusted for difficulty (four, five or six Epidemic cards are shuffled throughout the player deck), so once you start discovering some strategies, you can adjust the threat to suit. This new edition of Pandemic has two expansions to increase the complexity and add lots more options: On the Brink and In the Lab. The former includes new cards, new roles, rules for 5 players, and several new challenges: The Virulent Strain, The Mutation, and The Bio-Terrorist. The latter includes a new game board that brings the game into the laboratory to find cures, and adds new roles, new Virulent Strain events, team and solo play, and a Worldwide Panic Mutation scenario (that sounds like a hoot!) We’ll be sure to review the expansions when we get our bio-sealed gloved hands on them. 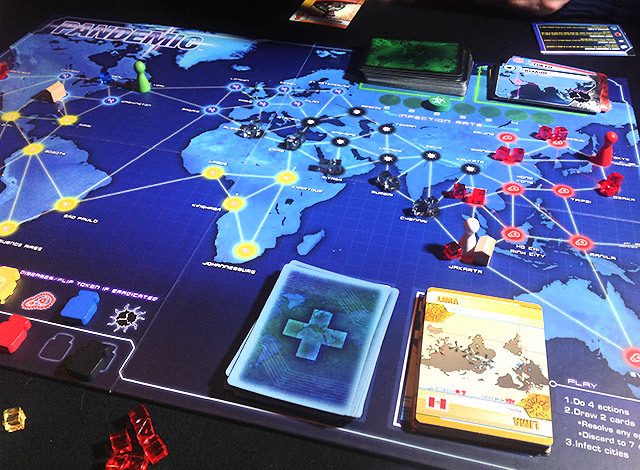 And if that isn’t enough disease-eradicating fun, there’s also a version of Pandemic available for iOS, with solo (controlling multiple agents) or pass and play modes, online play or an AI that controls the other players. Production-wise, the new edition is very nice indeed. Diehards may disagree, but I prefer the tasty little translucent disease cubes that replace the first edition’s wooden ones. Just don’t let small children near them as they almost beg to be popped in the mouth. There are two extra roles: the Contingency Planner and the Quarantine Specialist. The wooden markers and little vial-shaped cure markers are very thematic. Overall the game has a high-tech feel that wisely steers away from the grim realities of worldwide pandemics and their consequences. This perhaps goes too far in the case of the somewhat bland, lifeless cover and character art, but the edition is a quality production with pricing targeted for the mass market. When Xmas comes around and media outlets start trotting out the same tedious ‘games for kids’ lists full of Battleship, Monopoly and Cluedo, I could cry in frustration. Because a game like Pandemic is perfect for mass market success—simple to learn, dripping with theme, tense and fun and suitable for all kinds of players. It’s the perfect way to introduce friends to the wonderful world of boardgaming—albeit, in this case, a world overrun with global-munching contagions. If you haven’t, for some bizarre reason, caught the Pandemic bug yet, it’s definitely time to get infected. I just really, really hope they don’t make a zombie expansion. I’ve re-written my Pandemic rules summary after getting the new edition, and of course updated the graphics. At the moment it’s just the core set rules but hopefully I will be adding the expansion rules at a later date. The automatic game-board/card mechanism is great and fiendish as you say… and definitely impacts the threat level very quickly!!! but overall great game with loads of replay fun and definitely looking into those expansions!